I have a fantastic and fast recipe to share with you today. As a former salad-hater, I understand the "meh" feeling that can come from seeing a recipe for rabbit food (or, "cow food", to my dear husband!). However, I learned that the key is to include lots of colorful ingredients and whip up an easy, homemade dressing. I promise, it makes all the difference! The dressing on this salad is unbelievable and was so surprising. It is a bit spicy, but you can turn down the heat by reducing or omitting the canned chipotle chiles. I have terrible heartburn, but this salad was so good I couldn't help but dig in. This would be great for a relaxing night at home or for entertaining a group. Enjoy! *Heat a large skillet over medium-high heat. Season steak with salt and pepper. *Cook steak 2 1/2 minutes per side for medium-rare (or until done to your likeness). Transfer to a plate and cover loosely with foil. Let rest 5 minutes, then thinly slice. *Meanwhile, in a large bowl, toss together lettuce, avocado, cucumber, tomatoes and onion. *In a small bowl, combine chile, lime juice, honey, 1/2 teaspoon salt, and a pinch of pepper. Gradually whisk in oil and any accumulated juices from steak. 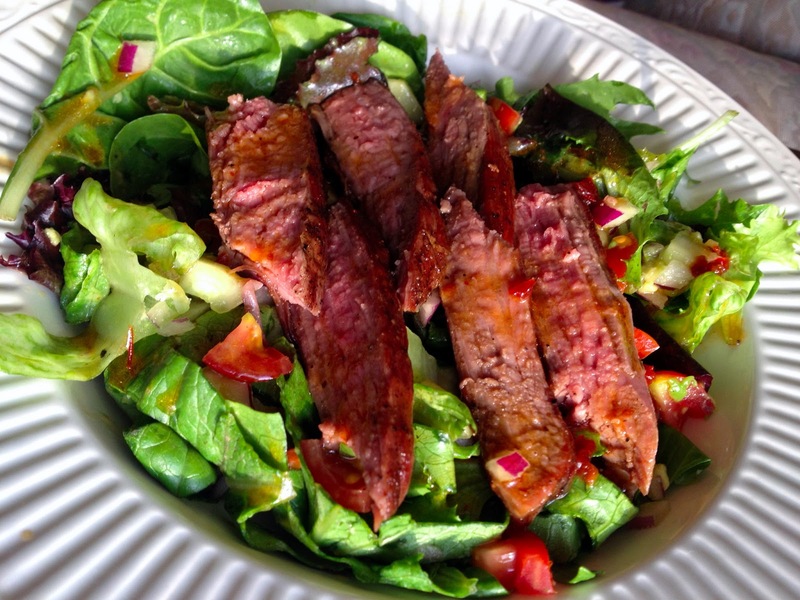 *Top salad with steak and drizzle with dressing.